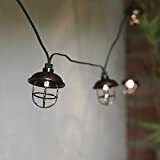 Make your garden stand out from the crowd and keep bang on trend with these solar copper metal lantern string lights. The 10 warm white LEDs glow gently through the warm copper tones of the 10 lantern decorations, casting unique shadows through the industrial, vintage style design. The crystalline solar panel stores up its power from the sun during the day and turns the lights on automatically at dusk, meaning this product is environmentally friendly and incurs no running costs. There’s no need to worry about replacing the battery either, as it’s rechargeable! We think these lanterns look great placed anywhere in the garden, but look especially great running along the tops of fences and gateposts.